We have now been sailing since about 4.30am yesterday and have had fantastic and occasionally exciting conditions. 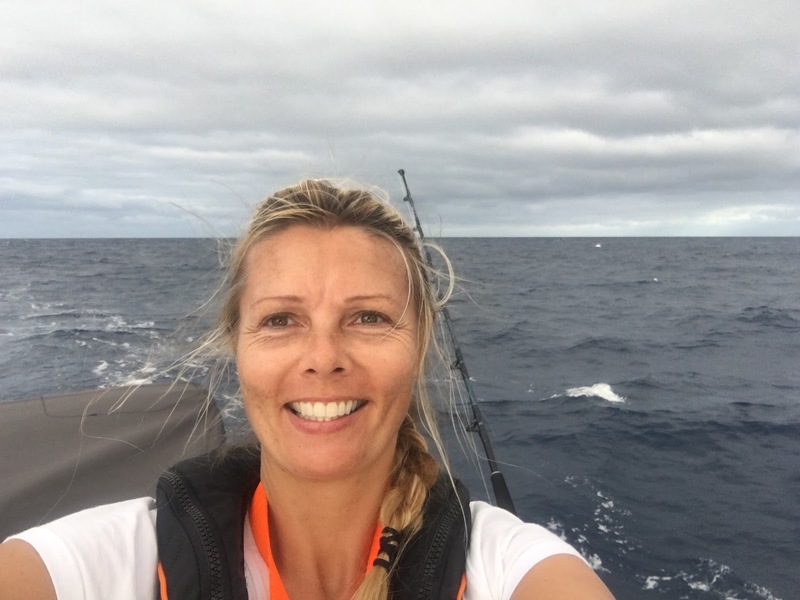 The wind gradually picked up through until midnight when we had 25 knots+ and a sea to go with it, on top of a north westerly swell of about 2m. Askari was surfing through the night frequently at 10 or 11 knots. 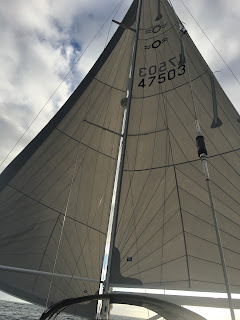 Late afternoon it clouded over and we set the jib on the spinnaker pole and started sailing wing on wing. This is very stable and safe in these sort of conditions, but takes a while to get all the lines run being very careful avoid any chafe points. Most of the time we have been running with the full main and jib, reefing the main when the wind settled above 20 knots. I'm not sure what else we did yesterday beyond the usual boat checks, cleaning and cooking, although we did both managed a nap. Andrew did the OCC radio net check-in which now has 4 boats and I spoke to Blue Roger in the evening. Blue Roger crew were very excited as they had caught their first fish - a Mahi Mahi which they had just had for dinner. We haven't put a lure in just yet as the fridge and freezer are both still bursting. Sadly we not in VHF range of Fenua anymore; we will send an email later to see where they are. We were hoping our distance in 24 hours would be a bit higher given the speeds we have been doing, however we have travelled in a bit of an arc, initially going south in the lighter airs and then more west as the wind picked up. The wind is supposed to stay with us today and then ease again, so we will probably take the pole down and head more south later on. Right now it's a bit noisy and rolly as the sea is far bigger than it should be for the wind, but we are hoping it will ease off soon. We are both going well and got good sleep last night - this morning we ran the generator and I grilled sausages for breakfast, which made Andrew very happy. He's now got eighties disco music playing loudly in the cockpit - oh gosh maybe it was better when he was tired! About 2,342 miles to go….. There's alot of ocean out here!